Did y’all miss me the last two weeks? I needed the time that I took off from blogging to spend that extra time with my Things. I also took some time to try out some more new recipes. 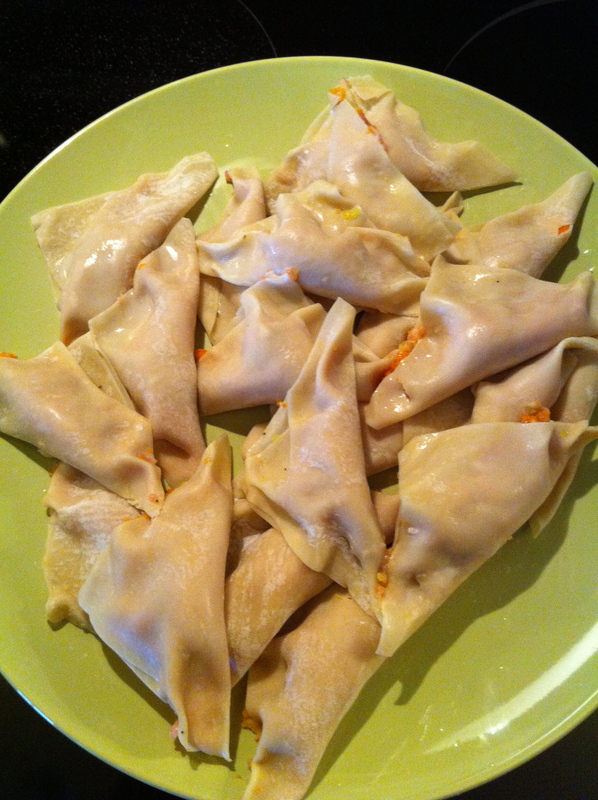 I have wanted to make potstickers for years. Yes, years! When we go out to eat I always order them. They come to our table with like a plate of 5 of them and I look at the plate and I recall the price of them in my head :sigh: and really, I could just eat a whole bunch of them as a meal. How do you like your potstickers? Steamed or fried? I love mine fried! BEST. WAY. EVER! You knew I would say that because I am from the south. Given the choice, it’s ALWAYS fried! I received this recipe years ago from a co-worker in Texas. I do not remember her name. I remember that this was her recipe. She brought some to work for a potluck and that was it. She had me with “Here’s the soy to go with it.” This is a dish where you really need to wait to get started until the Things are not under foot. 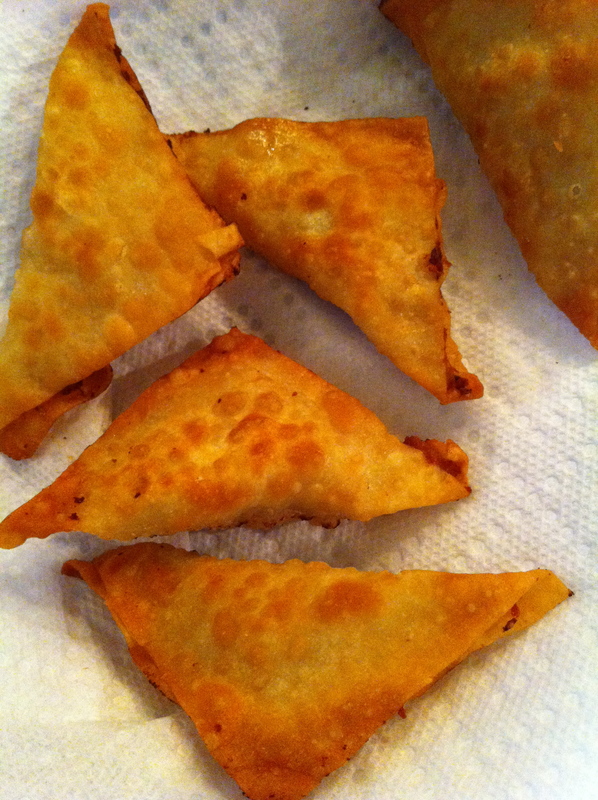 Especially if you are frying these. Is it worth the time to make these? Absolutely! You make so many at once you can freeze them in batches and pull them out for your meals when you want them. Everyone, I do mean everyone at the table ate them! This is the good stuff, trust me! Hold on to your hats because I am going to fly through this. It’s nap time at my house and I want some down time myself before we begin the afternoon routine. Chinese Cabbage (I used regular uncooked cabbage and I blended it in my food processor)– I probably used 1/4 of a small head of cabbage. Start with the Ginger. Snap off half of the root you purchased. You won’t use the whole root so no sense in peeling the whole root just yet. Grab your potato peeler and start peeling the skin off of the root. Then grate the root with a cheese grater into a large bowl. I probably grated about 2 tbsp of Ginger. Add your carrots (chop these up very small. 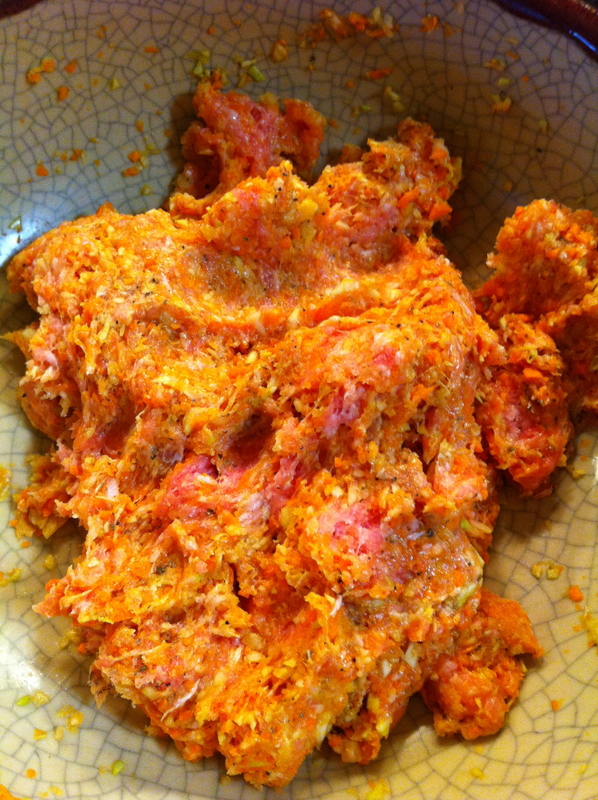 I cheated and placed mine in my food processor for a few rounds), raw pork, cabbage and spices in with your Ginger and mix really well. I used my hands. It should look something like this. Now we are ready to start filling the wrappers. 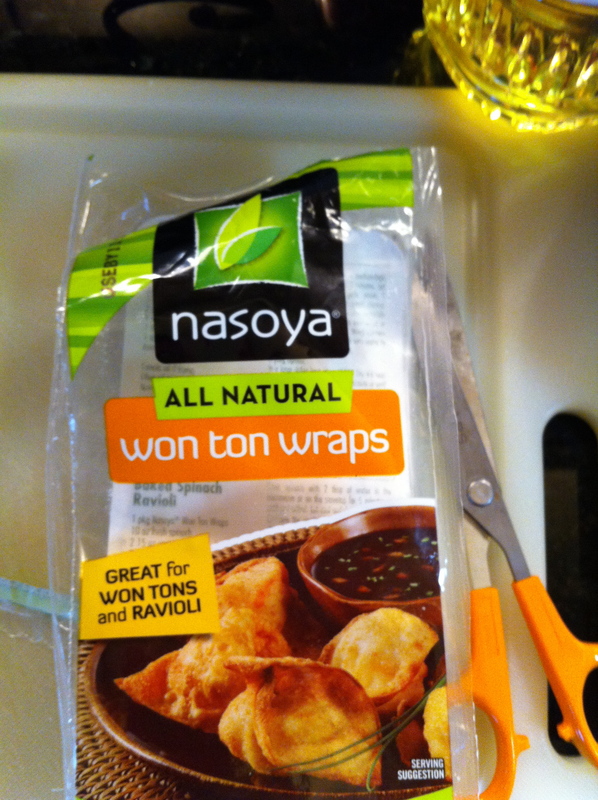 Here is a picture of the Won Tons that I purchased. Grab a stack out of your pack and create an assembly line: bowl of filling, wrappers and a clean space to place your uncooked pot stickers. 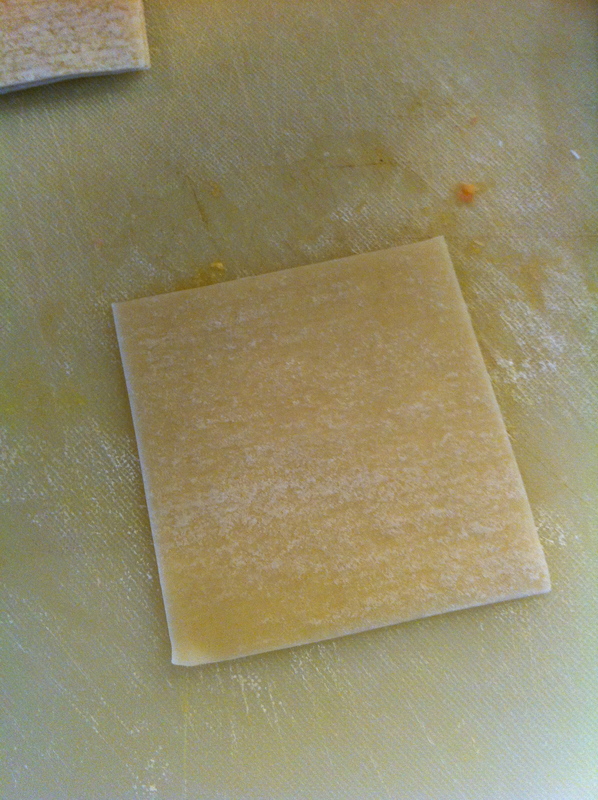 Take one wrapper and lay it out so one corner is at the top and one corner is at the bottom. Add your filling keeping in mind you will need to pinch the edges closed so don’t put too much in there. The less you fill them the quicker they cook and you want the meat cooked so be careful not to overfill. Brush the sides of the wrapper with your egg water mixture and fold one end of the wrapper over the other and crimp it shut with your fingers. Picture below is of the fold. 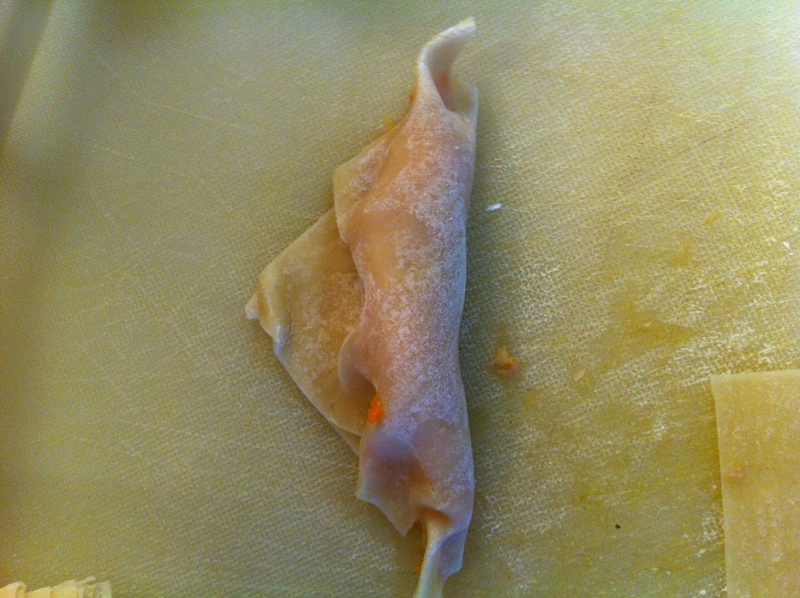 Gently brush your egg/water mixture on the pot sticker and set aside and fill the rest. When you are ready, you may either steam them or you can fry them in a frying pan until they are brown on each side. 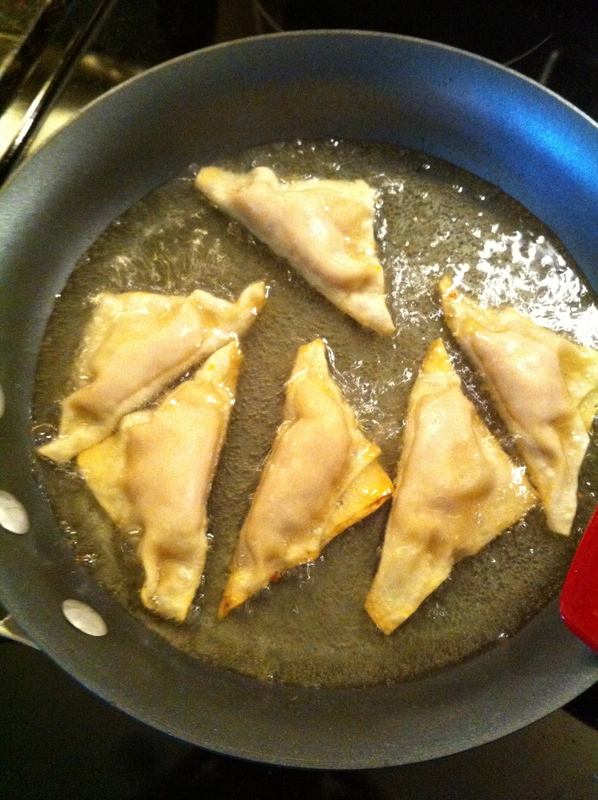 When adding the oil, you want just enough oil to creep up to the sides of the pot sticker. 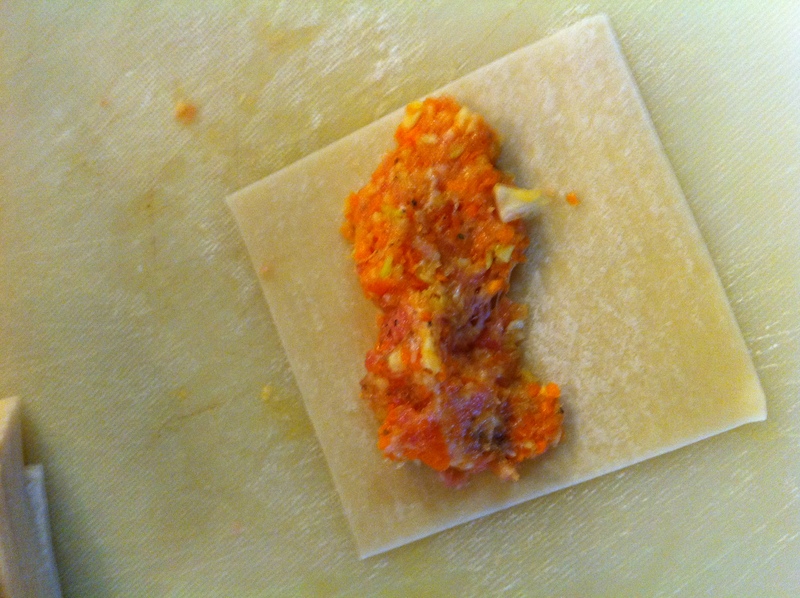 Watch the sides of the pot sticker. When they turn brown, you know it’s time to flip them. This is what they will look like when they come out. I probably made about 50 of them. They were SO GOOD! The Things shared my love for them and The Man was just simply impressed because I made them. I served mine with a small dish of soy. Enjoy! I am sitting in the playroom surrounded by toys, trucks, blocks and kids playing pretend. Today they are pretending they are heading to Mexico to put out fires. I’m not quite sure how they pick where they are going each day, but they do and they are both whole heartedly in on the adventure. Thing 3 is in charge of the fire truck and the dump truck today. He sits near enough to be content with their presence and far enough away that they won’t seek interest in his trucks so he can have them all to himself. I am very blessed to be sitting at home watching these three little Things do what they do best, play. It’s Friday, normally I try not to cook too much or bake but I feel like I am making up for lost time this week with a sick hubby and a sick Thing 2. This morning I have already made a loaf of bread and plan on making the Cream Cheese Pound Cake. Tonight we are having the Chili Cheese Tater Tot Casserole. I have been craving fall foods. I think I am just ready for cooler weather. Not sure how much of that I am going to get here, but still yearning for it. I am having to hold myself back from decorating for fall. Last night I made an oldie, but goodie. 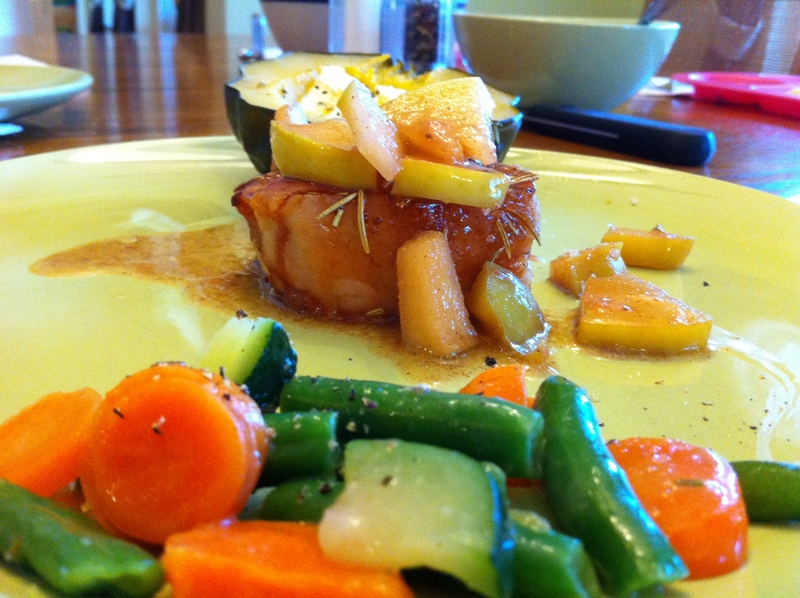 Apple glazed pork chops.The first time I ever made this dish my first thought was of French toast. Not only is it good, but the kids like it because it has the sweetness of the apples on the meat. Pre heat oven to 325. Thaw your pork chops. In a small bowl, mix your brown sugar, salt, pepper and Rosemary. 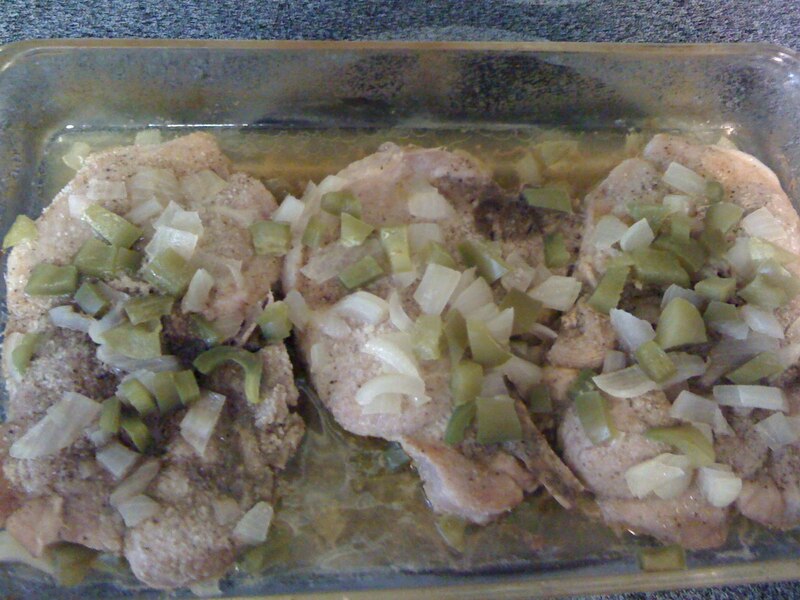 Using your hands, rub the mixture on the fronts and backs of your pork chops. Let them sit for 15 minutes. The original recipe instructs you to then rinse your chops. I skip that step and leave the tenderizer on the meat and bake them in that goodness. While the pork chops cook, the sugar bakes into the pork creating a thin glaze/syrup. About 15 minutes before your pork chops are cooked through (my pork chops were super thick so I cooked them at a lower temperature (325) for a little over 1 hour) start your apple glaze. Chop your apples into small pieces. The smaller the apple slices the quicker it cooks. I leave the skin on, but you can peel if you would like. In a small sauce pan, stir your bacon grease (or butter), apples, jam, cinnamon, and broth. I used my homemade strawberry jam. The original recipe calls specifically for apricot jam. I didn’t have that so I used my home-made strawberry jam. I believe I threw in a little less than 1/3 cup. 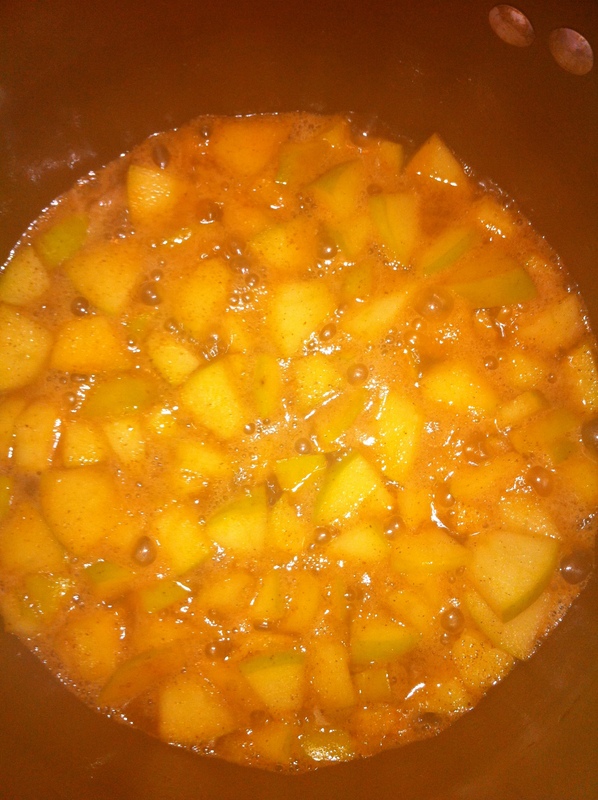 Stir frequently until the apples and broth create a thick sauce. You want your apples tender but not mushy (about 15 minutes). Pour the sauce over the pork chops and serve. I served this with steamed vegetables and acorn squash. Delicious late summer, early fall recipe. You know those super thin pork chops? They really are great for frying. If you try to bake them you really have to keep your eye on them because they will dry out and burn in a second if you aren’t paying attention. I am always looking for something good to put on those. 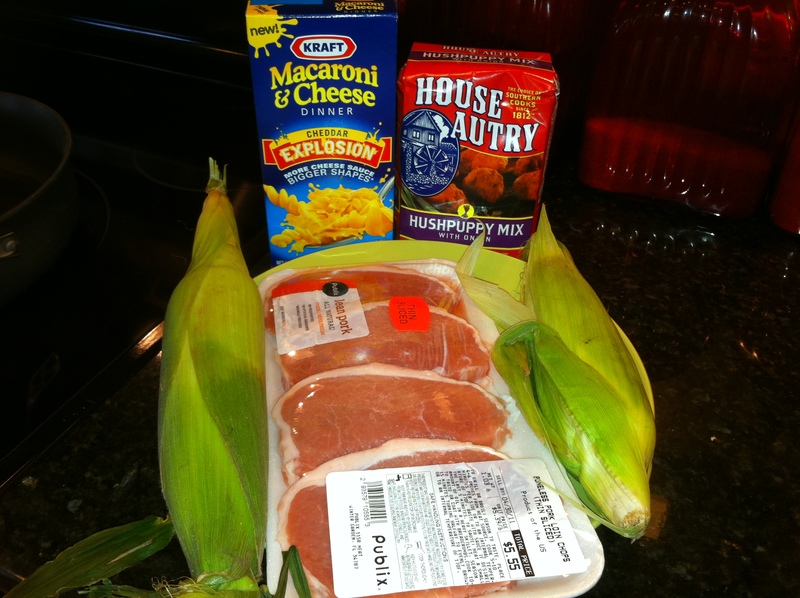 The day that I was over at Southern Plate for the Chicken Fettuccini recipe, I saw her recipe for House Autry Pork Chops. So easy and the kids actually liked these a lot. Thing 1 and Thing 2 ate one whole pork chop a piece with no complaints. 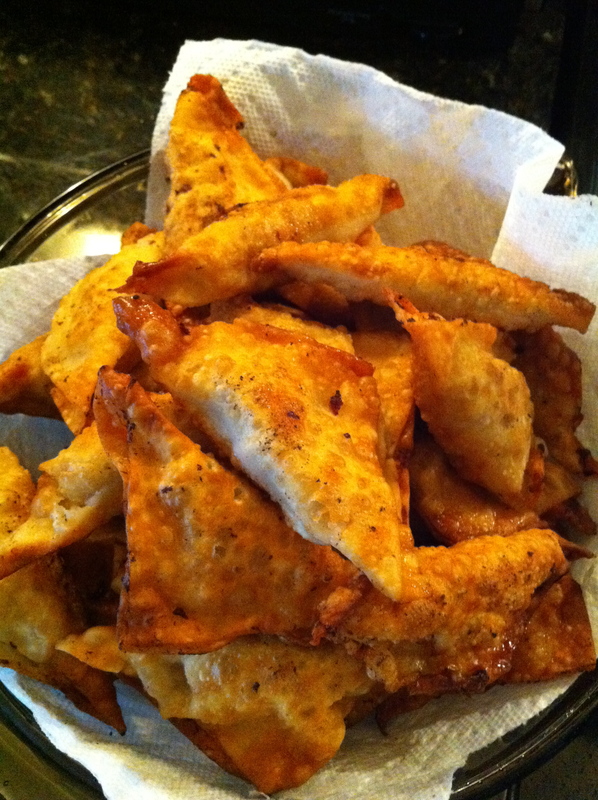 Was it because of the mix or because it was fried… who knows, my kids are southern because of the way I cook so if it’s fried, it’s will be consumed by them. I can say that the man liked the onion flavor and told me he liked them twice in between bites of corn. What you need to make this very easy, cost efficient dinner! House Autry Hushpuppy Mix. Brilliant idea! I bet instead of using flour on my zucchini and squash this would be good too. Maybe even coat some potatoes with this. So many things to try! Be sure to get the onion flavored kind. Now you aren’t going to grab the eggs and milk for this. Confusing, I know. Hard habit to break for a good southern cook. For this you simply need the mix. Pour some mix in a plate and start dredging your pork chops, one by one. 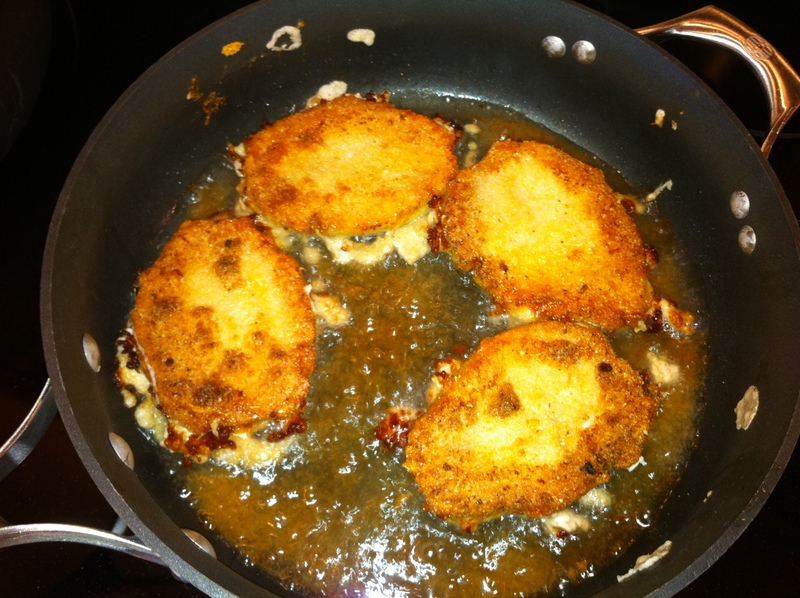 Use thawed pork chops before you start dredging and frying. Heat your oil in a skillet. Make sure it’s nice and hot. I throw a pinch of my flour (or in this case the House Autry) in the skillet. If it starts to bubble up then I know it’s ready. Carefully place your pork chops in the hot skillet. You could probably fit all of your pork chops at once depending on how man you bought. I had four so it worked out nicely. You will want them nice and brown on each side. See how my chops aren’t quite brown in the middle? I needed to flip them and fry them some more on that side. How long on each side? Somewhere between 3-5 minutes. Mine took about 5 minutes each side. 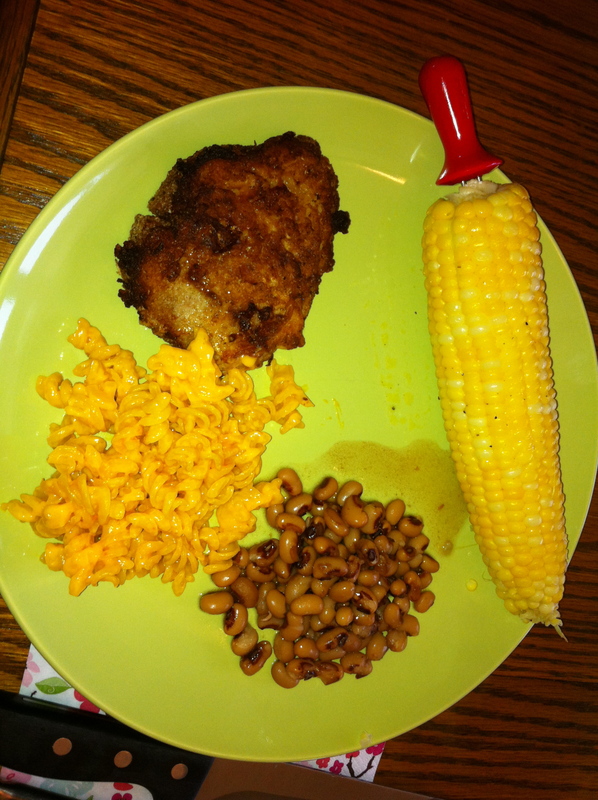 I served mine with macaroni and cheese, black-eyed peas and corn. Most of you know by now I am from South Carolina. You can take a girl from the south (I haven’t lived in South Carolina in over 6 years) but you can’t take the south out of the girl. I grew up drinking sweet tea right after I learned to walk. I have the fillings to prove it. We ate Roger’s BBQ (if you are ever in Florence, look it up) every Thursday night. We grew okra, zucchini and squash in our garden specifically to fry it in the summer time. Pulled pork, chicken bog and sweet tea is just part of the food triangle for me so when the good Lord moved us, I panicked a little. Before I knew how to cook, I suffered in silence. Florida doesn’t have real BBQ. They serve you meat and you pour sauce on it at the same table that you are eating at… um no. Texas has great ribs and their beef is the best you will ever have but BBQ? Nope. Sorry folks, the Carolinas have it down and we can always tell where you are from by what type of BBQ you order. The midlands of South Carolina is mostly mustard, but the low country of South Carolina (where I am from) is vinegar. North Carolina is primarily vinegar and Georgia is tomato. As soon as I got comfortable in the kitchen I started trying BBQ recipes. I don’t buy a whole hog and I don’t have a smoker, yet, I make it any way I can. In the oven, in the crock pot.. I just get ‘er done. Chop your onion and set it in the bottom of your slow cooker. 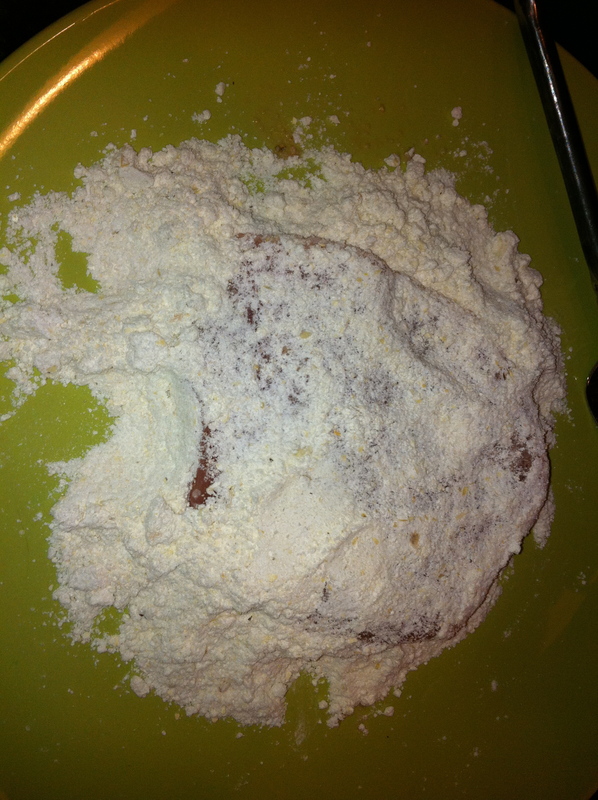 In a large bowl mix your sugar, paprika, salt and pepper together. This will be your rub. Use your hands y’all, it will wash off, I promise. Set your roast on top of the onion in your slow cooker. Now mix the rest of the ingredients together: liquid smoke, apple cider vinegar, Worcestershire, red pepper flakes, mustard and garlic. Pour half over your roast and refrigerate the rest. Place the cover on your slow cooker, set it to low, and let it go… for the next 6-8 hours. When it’s done take it out of your crock pot and let it rest and cool. Split it in half and take two forks and pull it apart. If you really know what you are doing ~wink, aren’t you glad you have me here to walk you through it~ when you are shredding it, you will place the side of the meat that does not have the rub on it (what was the center) down on your cutting board so you don’t lose your rub on your board in the process of shredding. 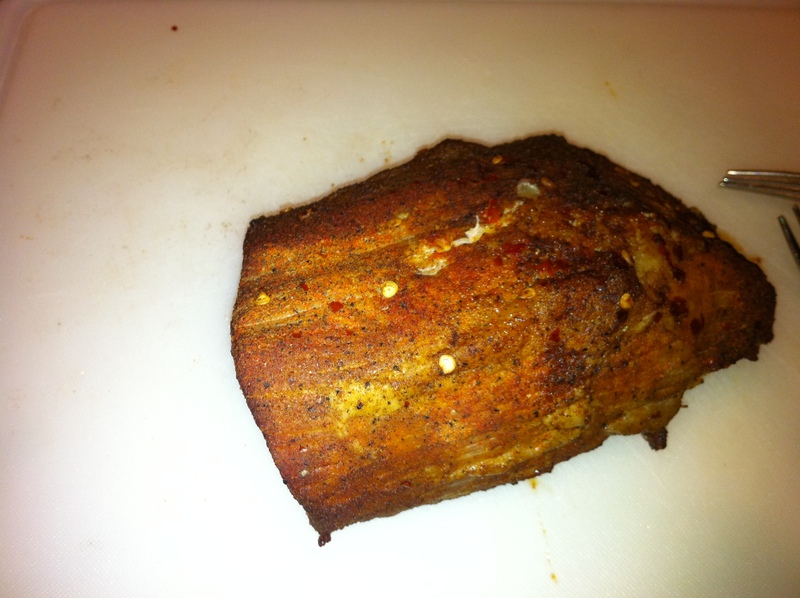 Once you have shredded all of your pork, place it in a container that has a lid to it. Pour the juice from your crock pot on to your shredded pork, grab the rest of your juice from the fridge and pour that on there too. Stir it. Let it sit in the refrigerator for 24 hours. Here is the trick that no one will tell you. If you can wait, do it. It gets better with time. If you put the crushed red pepper flakes in there it will have a little kick to it after the first 24 hours. After 48 hours it’s perfect and I do mean perfect. We went to Sea World over the weekend. I put this in night before, went to bed and turned it off when I woke up around 7am. I shredded it, and let it marinate while we were at Sea World all day. When we came home we had sandwiches. I froze half and we ate off of the rest of the for two more days. You can’t eat this with out the fixings so let me share the recipes I used for my fixings. Now this one is an oldie but goodie. We had marinated tomatoes as well that night. Growing up my Nonnie and my mom would pick cucumber, tomato, and bell pepper from our garden. They would also add some onion, olive oil, sugar and apple cider vinegar with loads of salt and pepper. We called it Goulash. It’s another one of those comfort foods for me that I haven’t had since leaving home for college. 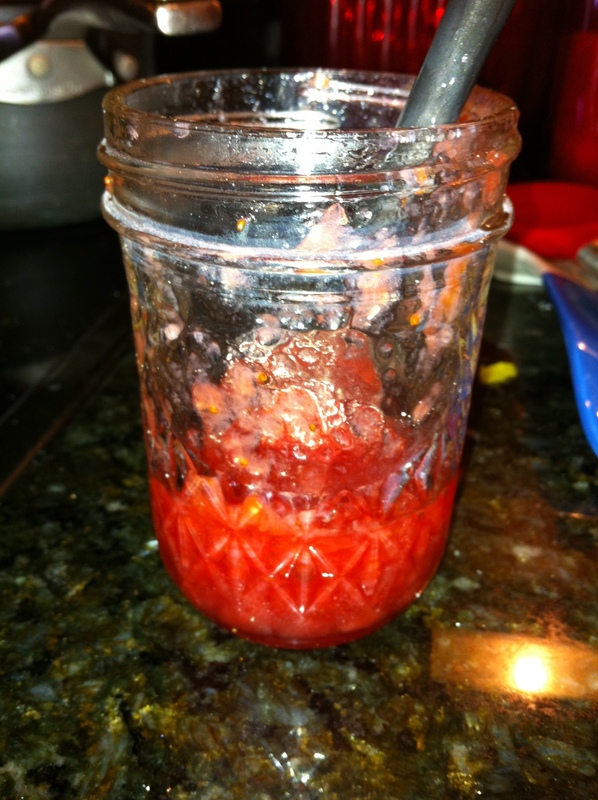 I hadn’t thought about it in years until I ran across a post on someone else’s blog about marinating tomatoes. I didn’t have time to actually think about what I was doing.. I saw the very large tomato I picked up at the Farmer’s Market on Saturday sitting in the fridge and just went to it. Slice your tomato(s). I only used one for this because that is all I had and the two of us (the man and I) ate off of this for the next 24 hours. In a container (with a lid) add salt and pepper, I used my fresh basil and Thyme from my little window sill herb garden (use what you have), about 1/4 cup of olive oil, about 1 tbsp of lemon juice, 2 tbsp of apple cider vinegar, about three green onions (just the green), a tsp of sugar and a tbsp of minced garlic. I know that I added more of something to get it where I wanted it but I am not sure what. The above was just estimates of what I threw in there. I didn’t measure when I was doing it. When you first taste it, you will taste the shock of the vinegar, lemon then the sugar and that’s all. Let it marinate for 24 hours before eating it. As we sat at the dinner table that night I was trying to explain to the kids why the man and I were so happy about our meal. I was telling Thing 1 that even though she wasn’t born in South Carolina and may never live in South Carolina, she will know what soul food is and WILL learn how to cook it. She doesn’t even realize she’s going through southern belle training. Before she leaves my house she will appreciate a good home-grown tomato sandwich, fried okra and squash, good BBQ, chicken bog, country ham, sweet tea made from the coffee pot, and learn how to fit a piece of cucumber in every sandwich. This along with some family recipes that I will pass down. They boys will learn how to smoke a hog so I can finally have a real pig picking 🙂 y’all have a great weekend! You won’t hear from me until Monday. Try this out over the weekend and do it up Southern style with a tall glass of iced sweet tea. 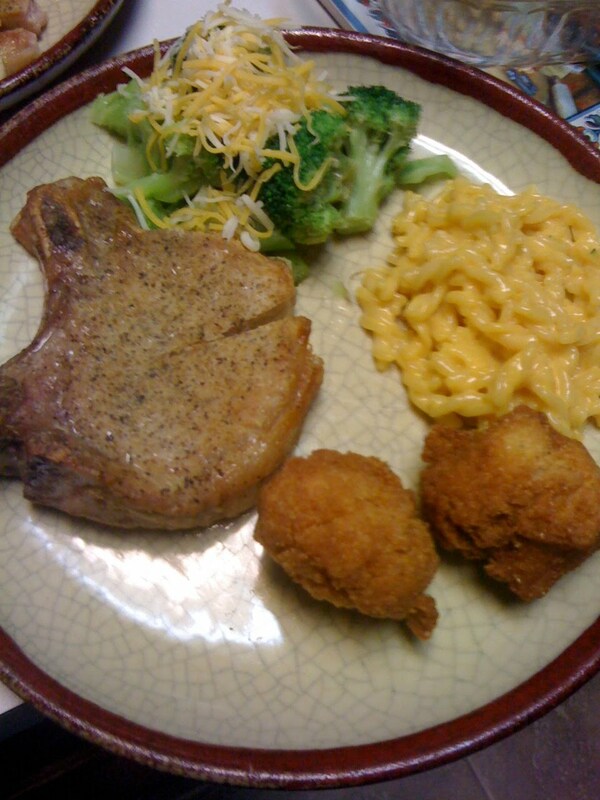 I was supposed to have pork chops and rice tonight, but I didn’t feel like having rice tonight. We had arroz con pollo last night and it was made with rice. 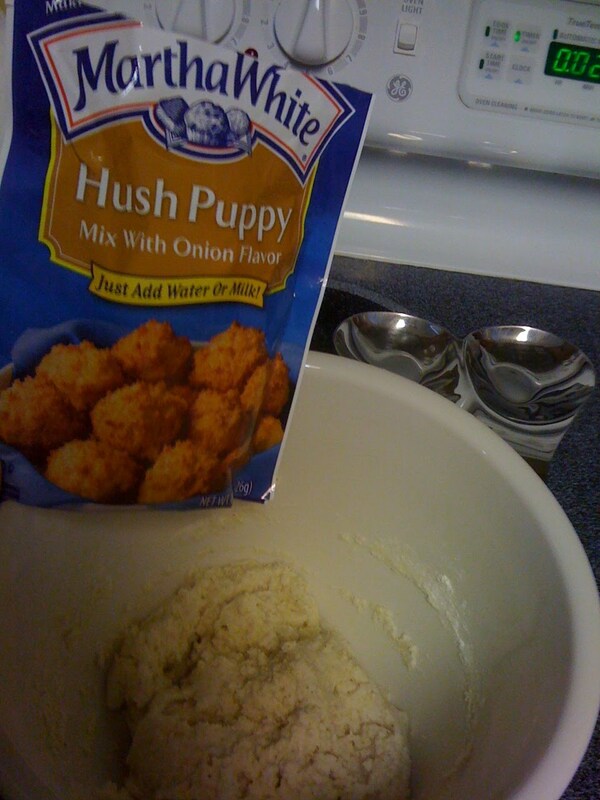 So, I pulled out mac and cheese, broccoli, and hush puppys (I keep wanting to spell it like this- hush puppies. I am wondering which way is right for these since it is a food lol). I have been dying to try these hush puppys. For some reason I never get around to making them. Well I did tonight. I found these over by the cornbread and picked them up a good while ago. 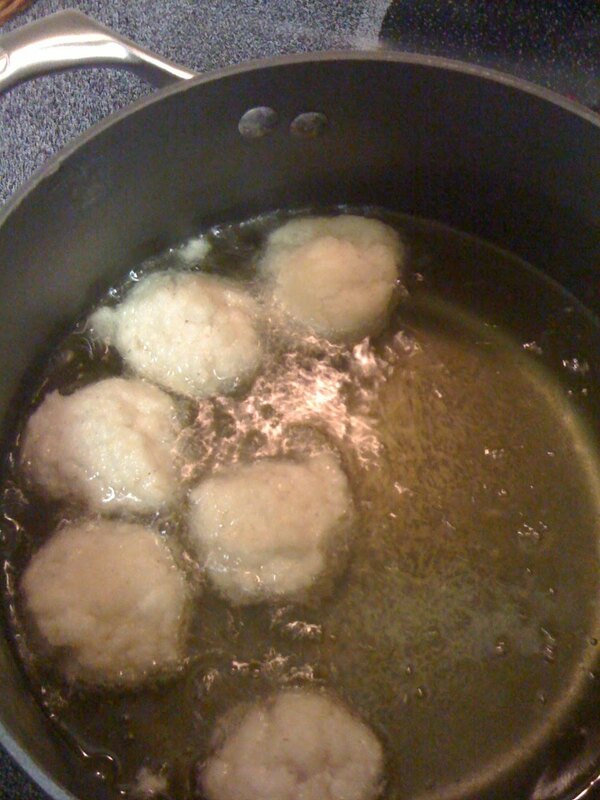 Preparing them wasn’t hard… waiting for them to finish frying so I could try them was. I don’t have a deep fryer anymore. I got rid of mine because it was so old and I haven’t replaced it yet. I had to make these the old fashioned way. I threw five or six in there at a time. I probably could have put more, but I am over cautious when using grease now. I started a grease fire while making french fries in college and that my friends will change you for life- and the way you cook with grease. 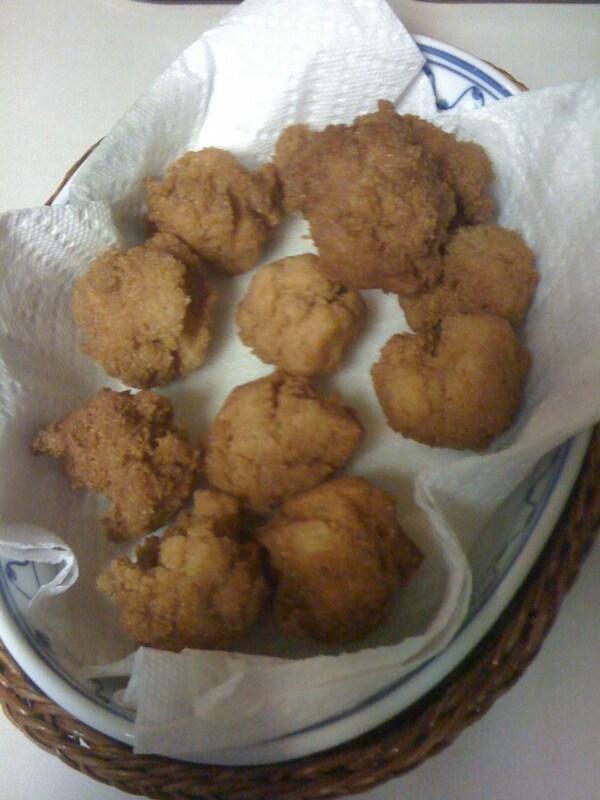 Cooking the hush puppys without a deep fryer was a HUGE step for me tonight. Mostly because there was so much oil in the pot to deep fry them. I have no problems frying chicken or pork chops in a pan but this much oil in a pot scared me. I had my canister of flour and the lid for my pot literally sitting right beside the pot. For years, I wouldn’t cook because I was too scared I was going to start another fire. Finally, someone bought me a deep fryer and taught me how to make bacon and eggs in it. They started me off very slow, cooking with regular foods in a deep fryer. I felt a little safer using it than the stove… eventually I started to cook again on the stove. Years later, I started to fry again (but only with someone standing beside me.) That lasted for a few more years and sometime after Thing 2 was born I was finally able to start frying by myself with no one around. Here are my hush puppys. Cooked, ready for consumption. I burned my mouth trying to scarf one down because I had to know if they were like the ones we eat at our favorite BBQ buffet in Florence, SC. They weren’t. They weren’t soggy and mushy like I like them. They weren’t bad… they just weren’t like I wanted them to be. The kids loved them. So, for the kid’s sake, I will grab another bag next time I am out grocery shopping. I threatened immediate bedtime for everyone (including the man) if they didn’t eat their trees tonight. I have a whole family (including the man) who HATES veggies. Seriously, I have to hide them in our food so everyone will eat them. I don’t understand how this can be- other than it’s genetic and he passed it down to our kids. I learned how to hide our veggies in our food using Jessica Seinfield’s cookbook, Deceptively Delicious. Which, by the way, has a ton of great recipes for kids! Love that cookbook. We have a few favorites that are on our rotation from that cookbook. 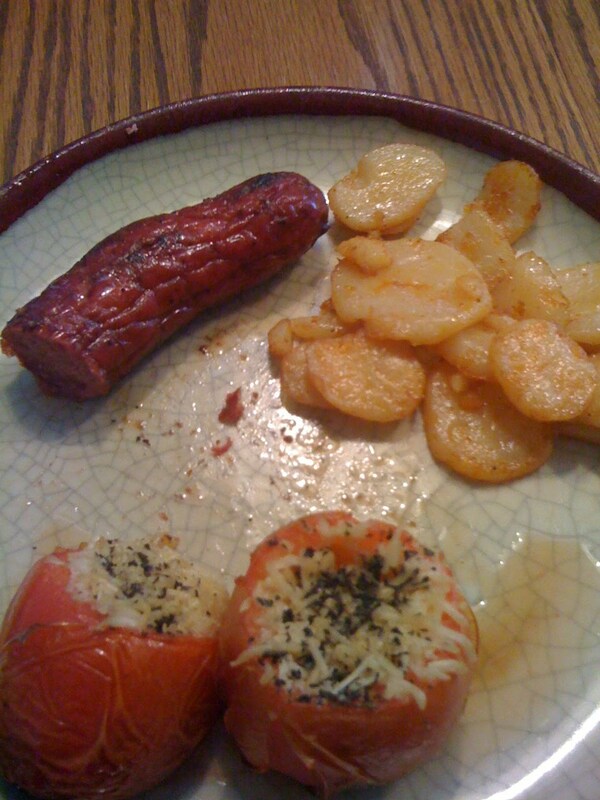 We were supposed to have Kielbasa, potatoes, and sauerkraut the other night. The dish itself is a recipe I got from a great friend, Galit Hill. It’s on our rotation at least every other month. We love this one. 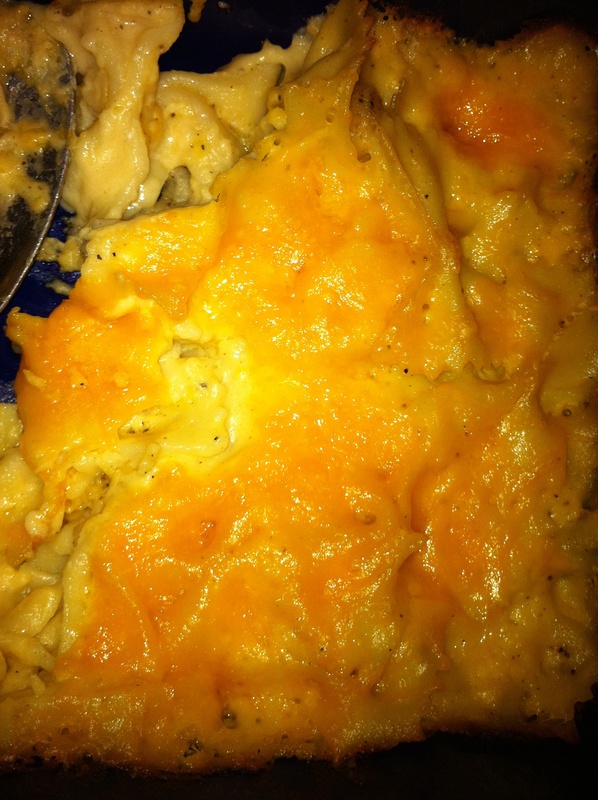 Lately, every single time I am supposed to make it so I can post the recipe, something comes up and I don’t get the pictures or we don’t eat it. This time, the night we were supposed to eat it I really wanted to go to Fredricksberg and eat some real German food. I was really bummed out about it because I was craving the real stuff. So my great hubby said he would take care of our dinner and do the best he could to make it “German” for me. He did great. He grilled my sausage and fried my potatoes. The potatoes were awesome! The tomatoes are there because I had just written to another friend on FB about these tomatoes and I had to have them. These babies are so good. I could just sit around and eat them all day like chips. Slice the long vine looking tomatoes in half (the man just cuts the tops and digs down a little bit inside the tomato). Add garlic, olive oil, Sea Salt, basil and parmesan. Grill until cheese is melted. These are delicious! 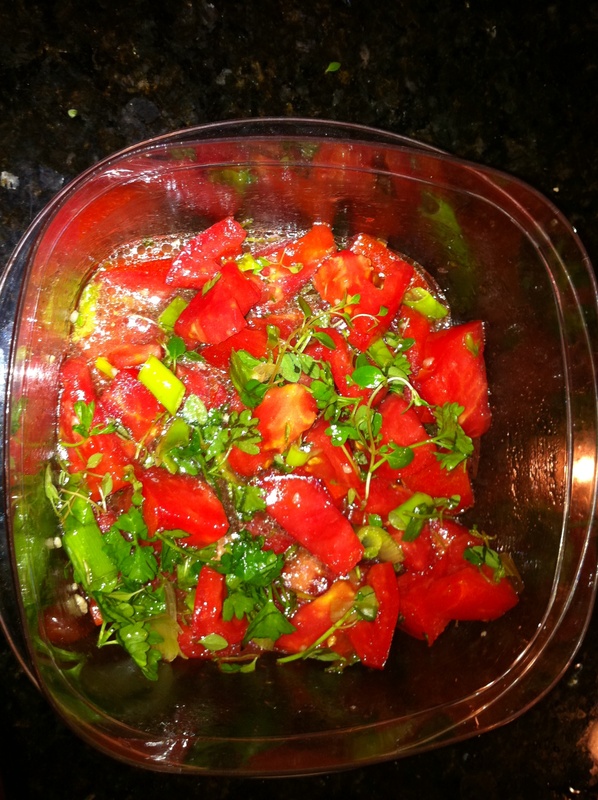 I love tomatoes in the summertime- it’s like sweet tea- a must in this life. I love tomato sandwiches (tomato, mayo and bread with loads of salt and pepper). We usually eat these with grilled chicken and cut the tomato up and eat it with every bite of chicken- HEAVEN ON EARTH! We have a little bistro here, that is our place for special occasions- they make these to go on their pizza- we special order them separate just as a side (we are probably the only ones who do this lol) and I eat them with their lamb. DIVINE! Just do me a favor and try them. I want you to tell me what you think when you are done. Now that I am not pregnant anymore, my taste buds are returning to normal and my enthusiasm for cooking has completely returned. I can not say the same about my energy. Thing 3 is on his way to sleeping through the night (got five hours out of him last night) but we still aren’t there yet. I will warn you now this post may be poorly put together. It has taken me an hour to write these four sentences. Thing 3 is having a rough night- or past two hours. I think he is finally asleep. So, I have been trying a few new recipes out and thought I would share. First off biscuits and gravy. I wish I had this recipe in the beginning of my pregnancy. Growing up (in S.C.), I was accustomed to eating biscuits and gravy pretty much every weekend from Hardee’s. My dad would do a breakfast run for us every Saturday and this was my favorite! When I got pregnant with Thing 2 and Thing 3 this is one of the things I craved early in the pregnancy. Lucky for me ,when I was pregnant with Thing 2, they served it every Friday in the WaMu cafeteria. Thing 3 was a different story. Texas is just now getting Carl’s Jr. (my part of Texas) and when I was in the first few weeks of pregnancy with Thing 3, the nearest Carl’s Jr. (aka Hardee’s) was over half an hour away from our house. That has since changed, but now that I have this recipe I don’t have to go to Carl’s Jr. 🙂 This recipe comes from the Pioneer Woman’s website. You can check out her website by clicking on the recipe title Biscuits and Gravy below or you can follow her on Twitter by clicking on her name above. Here is what worked for me and didn’t work for me on this recipe. First off, she calls for a roll of sausage. Because I have more to do than make breakfast in the mornings, I bought the Jimmy Dean Sausages that were already made into 8 patties. It saved me some time and I was able to get bottles going while I watched the sausage cook. I should also mention that I probably used a skillet that was too large for the amount that I was cooking. Back to my point- rambling because I am tired. The ready made patties didn’t produce enough grease to get a good gravy going. By the time I added my flour it was just not creating the right consistency for gravy. Because I am southern, I have a coffee cup of bacon grease in the fridge. Once I realized my gravy was ruined, I poured it out and started again (in the same skillet). I used about two large soup spoonfuls of bacon grease and followed the rest of her directions. Again, because I’m southern, I added poultry seasoning to my gravy. I am a gravy snob. It has to have just the right taste, especially gravy for biscuits. It would have been better with the sausage grease, but my improvised bacon grease worked just fine. In the end, Paul had no idea and had seconds. Also, re- reading this paragraph and just thought I would let you know that while I do love my husband and love to cook, it’s rare that I make a hot breakfast in the mornings. I am not a morning person. I made this as a Father’s Day brunch for when he came home from church. Now on to Pork Chops. I have pictures! I ended up making this tonight so I was able to take pictures. This is my own little creation…if you are looking for healthy- keep on looking. Very simple stuff people. Season your pork- for me, the more the better. 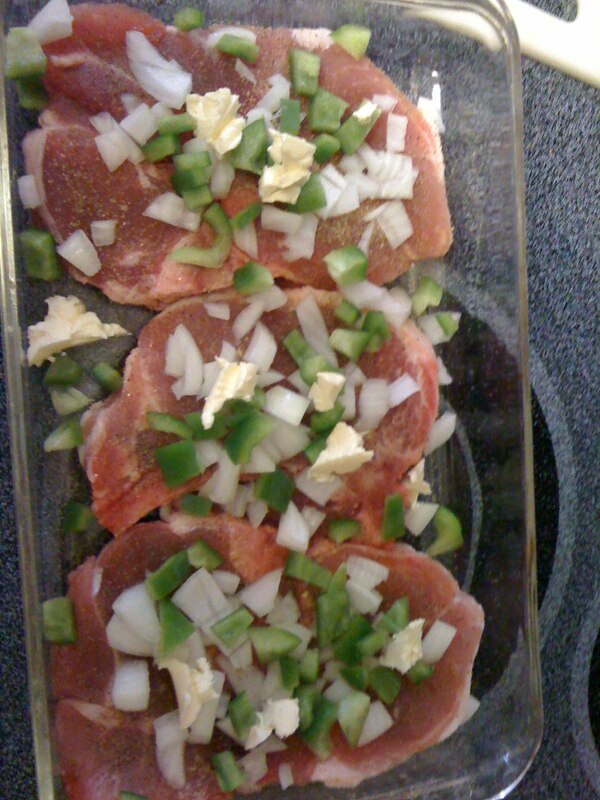 Sprinkle your diced onions and pepper on top of the chops. 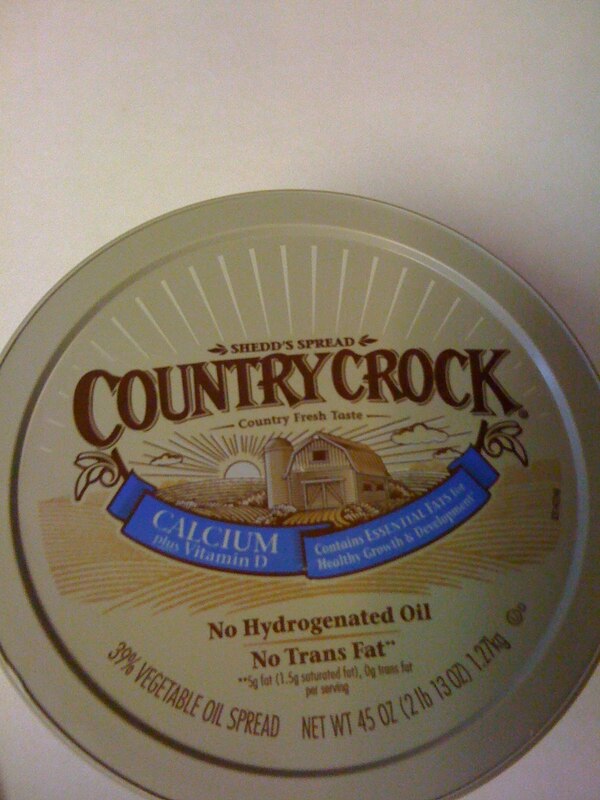 Now, add slivers of butter everywhere… when I say butter please don’t think I mean that stick stuff- I mean the good ‘ol brown tub of Country Crock goodness. 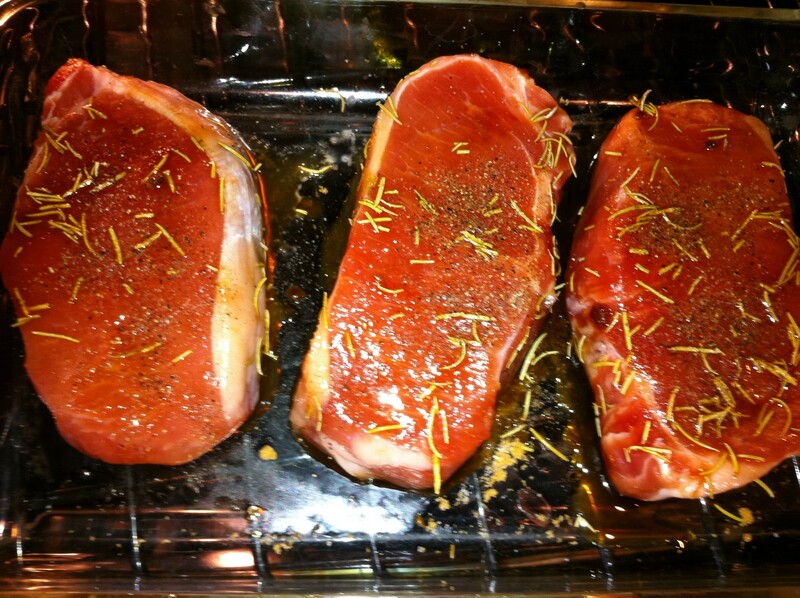 Now, I like my chops to be moist not dried out- if this is your preference as well throw a piece of tinfoil on top. Pop it in the oven.. wait for it… in 15 minutes your kitchen will smell amazing and your mouth will water as you smell that onion and pepper cook into your chops. I am out of time for tonight, but had a few more recipes I wanted to post. They will have to wait- next up will be the best mashed potatoes I have ever had in my life (made me feel stupid for not thinking up the recipe myself), the grilled lamb chops I made for Father’s day, Arroz con Pollo and meatballs. Looking for some real southern comfort food recipes? Below I have typed out my favorites. I hope you enjoy!! Also, if you didn’t know, I was born and raised in South Carolina so my BBQ will be vinegar based (not tomato or mustard) and my bog and perlot may be spicy. For this recipe you can use chicken quarters or a shoulder. I like to use a shoulder – to me the meat is better. I found this recipe a while back and I jotted it down on paper. I haven’t been able to find where I got it from since. I am thinking it was someone’s blog because I remember seeing pictures of the chicken quarters she was using. 24 hours before making your BBQ you will rub your meat down with the rub and leave it in the fridge to sit before you cook. Go ahead and make the sauce too (and place in the fridge) because the sauce needs 24 hours to sit after you mix it. It seems like a ton of rub but it’s not. I mix all of my rub together in a large bowl and then place my shoulder in the bowl. I use my hands to rub the spices all over the meat and flip it a few times. In the course of 24 hours I will go in the fridge and flip it again to make sure the rub is getting in and all over the meat. After your meat has sat in the rub for 24 hours you are ready to cook it in the oven. I put it in the oven at 350 for about 4-6 hours. Cook time depends on how big of a shoulder you are cooking. Once the meat is done, take it out of the oven and let it rest for 10 minutes. Once it’s cool enough to work with you can begin pulling the meat apart and shredding it with your fingers. 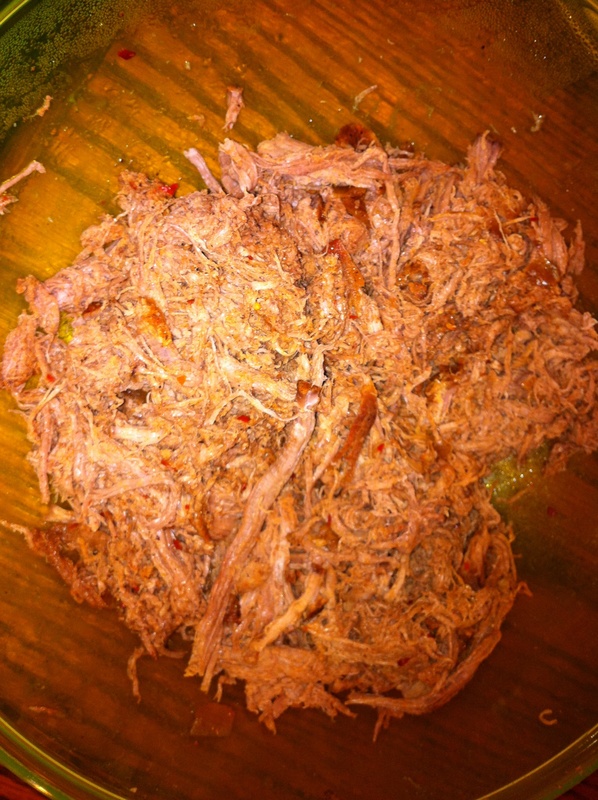 After you have all your meat shredded, place it in a big bowl and pour the sauce on the meat. I use about 1/2 the sauce that I make for a 2-3 lb shoulder. I also don’t eat the meat right away. After stirring the meat and the sauce together I put it back in the fridge for a few hours (even 24 hours) to let the meat really soak up the sauce. Then we eat it. It’s so good!! I know all the ingredients seem really strong when making this but as long as you are giving the meat and sauce time to settle and mix it turns out yummy! The same thing for this perlot recipe. I found it a while back when we moved from Florida to Texas and I can not find where I got it from. 3. Add the water and bring to a boil. Cover for about 40 minutes at a low boil. Throw the sausage and chicken back in the pot once the rice is done, mix and serve. You can freeze this as well. When I make this with the measurements I gave you in parenthesis it will feed about 4-6 adults. I leave my breasts whole, not cubed salt and peppered and place them in a pot of boiling water mixed with a box of Swanson’s chicken broth, with my butter and bay leaves. I cook until the chicken in done. Once the chicken is cooked, I remove the chicken from the broth, throw away the bay leaves and let it cool. I measure out 4 cups of broth for the rice and place the 4 cups of broth back in the pot and bring to a boil again- once boiling turn it to low add the rice and cover to cook on low for 40 minutes. Once the rice is cooked I add my chicken (shredded or cubed) back to the rice and stir. Add salt and pepper as needed. We eat our bog a lot of pepper because that is how we eat it where I grew up. You can add other spices to it if you want. * A lot of my family make their bog with chicken wing meat. Again, I just don’t.. if you cooked quarters and shredded the meat, it would turn out really nice but usually when I making chicken bog its my “quick” meal and I am doing it at the last minute which is why I use breasts.